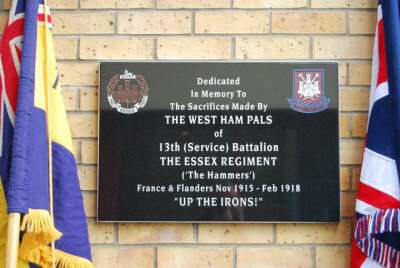 The West Ham Pals was a nickname given to the 13th Essex Battalion. The 13th Essex was recruited at the start of World War One from the West Ham area and as such the majority of recruits were supporters of West Ham Football Club. From November 1915 until it was disbanded at the end of the war, the Battalion fought in France and and advances the men shouted its own war cry " Up the Irons". The links between the men and the football club were great enough to have a plaque in their memory fitted to the stadium near to the Club Shop. 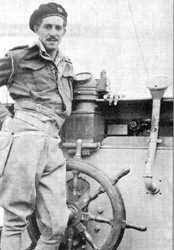 The memorial was provided after a campaign led by Elliot Taylor and sponsored by H L Hawes. It was unveiled in 2009 by Sir Trevor Brooking.